Access your email. 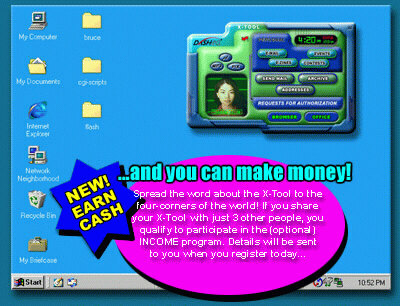 Never worry again about SPAM or unsolicited email with your X-TOOL. Advanced filtering algorithms that YOU set, assure your safety and privacy while online. Plus, the web-based email interface lets you read and send email from any location in the world. You can send file attachments such as word processing documents, graphics, spreadsheet files quickly, easily. The advanced encryption technology inside means you can send email without worrying about someone intercepting and reading your private correspondence online -- you choose who sends email to you!